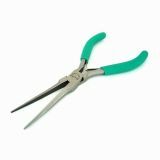 Needle-Nosed Pliers 1PK-709AS, 165mm Needle-Nosed Pliers model 1PK-709AS, serrated with overall length 165 mm. Needle-Nosed Pliers 1PK-34 Needle-Nosed Pliers model 1PK-34, serrated with overall length 145 mm. 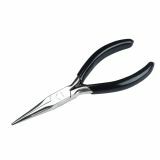 Long Nose Pliers With Side Cutters Knipex 26 12 200 Long Nose Pliers With Side Cutters Knipex 26 12 200 made of vanadium oil hardened steel with jaw length 73 mm and cutting edges length 15 mm. Flat Nose Plier 1PK-28 Flat Nose Plierс model 1PK-28 with smooth jaw and overall length 130 mm. Made of stainless steel with mirror polished finish. Suitable for household and professional usage. Long Nose Pliers, PK-102, 145 mm Pliers with dimensions 145 x 55 mm and hardness 45 ± 3 HRC. List Price 13.50лв. VAT Incl. 12.82лв. VAT Incl. 12.15лв. VAT Incl. 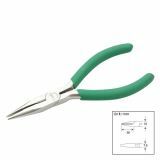 Needle Nose Plier, 1PK-046S, 150 mm Pliers with dimensions 150 x 48 mm and hardness 45 ± 3 HRC. Suitable for household and professional usage. Attention! Turn off the electricity before using the tool! 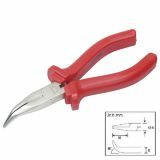 Long Nose Plier, 1PK-036S, 135 mm Cutter pliers with dimensions 135 x 52 mm and hardness 48 ± 3 HRC. Flat Nose Plier, 1PK-054S, 135 mm Pliers with dimensions 135 x 52 mm and hardness 48 ± 3 HRC. Bent Nose Plier, 1PK-065AS, 160 mm Pliers with dimensions 160 x 55 mm and hardness 48 ± 3 HRC. Suitable for household and professional usage. Attention! Turn off the electricity before using the tool!